My sons love to collect things on nature walks. We collect stones and twigs and leafs and acorns. If I don’t check their pockets before throwing in a load of laundry, I always regret it. 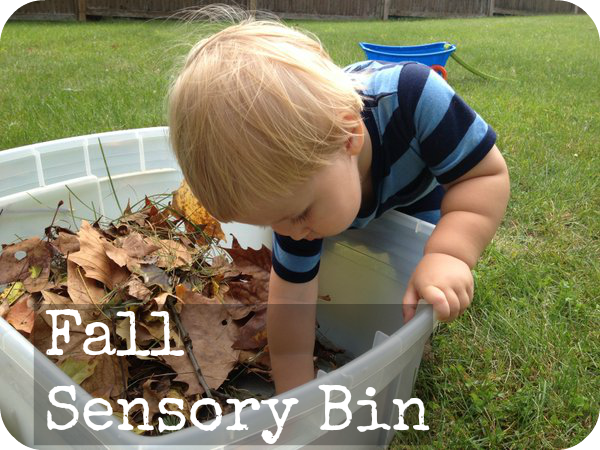 After a walk this morning, we decided to put our collection into a fall sensory bin, and discuss many of the changes in nature that come with the changes in the season. We got a bin and threw in leaves and grass clippings, gumballs (those prickly brown balls), acorns, pinecones, and rocks. 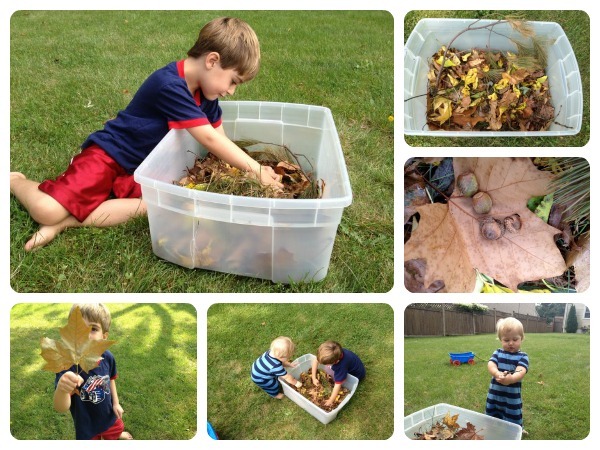 The boys played around in the bin, and we talked about what changes would happen to each of these things as fall begins. My 1 year old had fun picking up the different items, turning them around in his hands, looking at them, and feeling them. I help up different items from the bin for my 4 year old and we talked about how the leaves on the trees turn from green to reds, yellows, oranges, and then to brown, and fall off the trees. Acorns will be hidden away for the winter or eaten by hungry animals, pinecones will fall to the ground. The grass will stop growing. The rock will stay the same. Then we picked all the acorns out of the bin, and I told them we were going to pretend to be squirrels. We hid the acorns in the bin the way squirrels do- under caches of leaves, buried in the ground (we just hid them under the grass), under trees (we used the twigs we had collected as trees). After I told my 4 year old that squirrels don’t necessarily find the acorns they hide. Each squirrel hides stashes of acorns, and then during the winter, squirrels hunt for any acorns stashed away, not just their own. We picked out the acorns and took turns playing squirrel. One of us was the hiding squirrel, stashing the acorns in the bin, and the other was the hungry squirrel. I closed my eyes when he was the hiding squirrel, and then opened my eyes and found his stashes beneath the leaves. We reversed roles and kept playing. This was such a fun game that I think we will play again at the park, once Fall has actually started and there are even more acorns to gather on the ground.